Description A generously proportioned three bedroom second floor apartment occupying the top floor of this attractive and imposing Edwardian property. The apartment offers spacious accommodation with the benefit of gas fired central heating. The property is approached via a communal, wide staircase leading to the first floor which provides access for two apartments. The subject apartment then has a private staircase to the second floor. In addition to the accommodation there is a single parking space conveyed with the apartment and an additional visitor's parking space for use of the four apartments in this block. Location The property is situated in the ever popular Duchy area of the town, adjacent to the pine woods and Valley Gardens. The town centre is within walking distance as is the countryside surrounding the town. Other notable attractions of interest are Harlow Carr Gardens, again within walking distance. Tenure Leasehold - 999 year lease from an original term. Service charge - £70 per month. Buildings Insurance - £1,232 per annum. 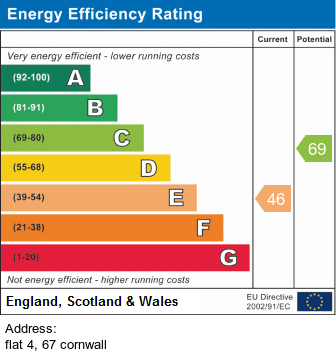 Energy Performance Certificate Grade E.